Miklós Erdély (1928–86), architect, artist, writer, poet, theorist, filmmaker, was an important catalyst on the unofficial Hungarian art scene during the 1960s, 70s and early 80s. Hailed as “the father of the new Hungarian avantgarde”, Erdély was a charismatic personality, always provocative and often irritating, especially to the authorities. From 1975 until his death he ran three conceptionally and methodically related courses in art – Creativity Exercises (in 1975–76, together with Dóra Maurer and György Galántai), Fantasy Developing Exercises (FAFEJ) and Inter-Disciplinary- Thinking (Indigo) – which were conceived as experimental teaching studios or workshops drawing on avant-garde artistic processes, new theories of creativity, educational methods influenced by Eastern philosophical traditions and many other sources. By his own admission, one of the aims of his art pedagogical activity was to “create a milieu in which it might be worth working at all”. He regarded his students as the most suitable critics of his own works. The Indigo Group grew out of the third course, which Erdély led from 1978. The name Inter- Disciplinary-Thinking refers, as Erdély put it, to the fact that they “did not give up the promising idea of working on the borderline of two cultures – science and art”. They were interested in questions concerning the functions and possibilities of art and considered these inseparable from creative thinking in society and life as well. 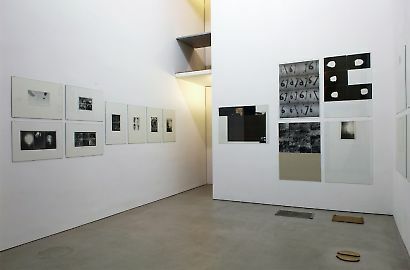 The Indigo Group arranged numerous thematic exhibitions and group actions between 1978 and 1986, which were centred around either some artistic medium (Coal and Charcoal Drawing, Sand and Its Forms of Movement, Painting, Avant-garde or Experimental Film, Watercolour, Paperworks, the one-year drawing course at the Museum of Fine Arts, 1982–1983), or an abstract concept (Weight, Faith / Loyalty, Artists’ Exit, The Poetic Avant-garde), or other personal experiences and activities (My Fondest Summer Memory, Biography, Table Actions). Among the socio-political manifestations, it is worth highlighting the Indigo Peace Call, the Founding Certificate of the Voluntary Legislative Body (1982) and the Pax Action (1983). 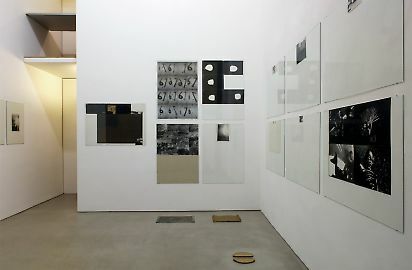 In the initial period, they regarded their presentations as joint works: they would pick a theme, gather an enormous sum of individual ideas around it (which are sometimes also exhibited); they select the best ideas together and modify these during the working process, so that it is impossible to decide who contributed what to the final version. From about 1980, however, it was first and foremost works of individual artists that were exhibited at group shows. Among these was, in March 1984, the exhibition The Personal and the Sacred (Ami személyes és ami szent), which was inspired by the thoughts in Simone Weil’s essay La Personne et le Sacré. Simone Weil (1909–1943) was a writer of Jewish origin, who viewed the world in a holistic way and was opposed to the division of knowledge into separate branches of study. According to Weil, people regard science, art and religion as separate territories because they are incapable of believing in a coherent world order. She believed in the accessibility of a higher, mystical knowledge characterised by unity and universality. “In science, truth is sacred. In art, beauty is sacred. Beauty and truth are always impersonal.” “That which is sacred is by no means our personality; on the contrary, it is what is impersonal in our human being. Everything that is impersonal in man is sacred. And that alone is sacred,” she wrote. Members of the Indigo Group produced photographic works treating the subject for the exhibition, The Personal and the Sacred, the large part of which have been preserved within the Erdély estate, and a selection of these is on view now at the Georg Kargl Gallery. 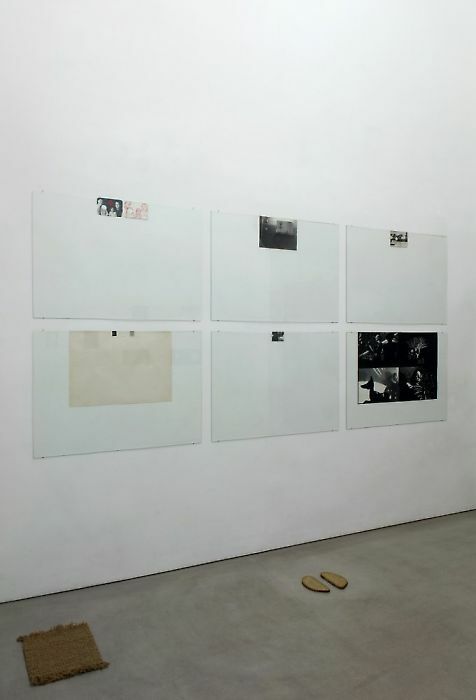 The method for the exhibition of photographic works follows the installation of the original, which was determined by the group as a whole in 1984: each photo was uniformly placed under glass of 70 x 100 cm, and the artists placed their “personal” doormats beneath some individual works. 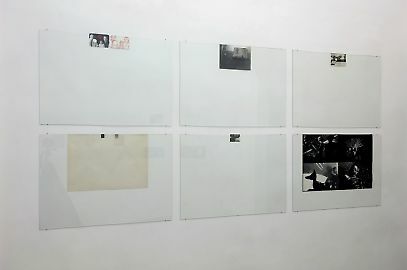 Erdély placed three figurative depictions at a distance from each other on a white sheet of paper, whose largest part was covered by a dark-coloured material. A newspaper cut-out is embedded in a thin, brown pulp of bitumen along the upper edge of the work, in which he left a smaller and larger part uncovered. On the left-hand side, the caption “Messiah appears“, and to the right of this a news story illustrated with a photo can be read, entitled The Absolution of Ali Agca. Visible in the photo are “the Pope and his would-be assassin”, while the text in the space kept free around the photo is as follows: “John Paul II met in private with Ali Agca, who on 13 May 1981 attempted to murder the Holy Father. Yesterday morning in Rome, the meeting took place in the cell of the Turkish terrorist. The Pope entered the cell alone. He embraced the convict and forgave him. The two men spoke softly for 20 minutes. As the minutes passed, Ali Agca drew increasingly closer to the Pope. They spoke in whispers. Most probably he told the truth about the attack in Saint Peter’s Square. At the conclusion of the conversation that appeared to be a confession, John Paul II said […] ‘What we discussed will remain the secret of the two of us. Ali Agca is a brother, whom I have forgiven, and he has my full trust.’ Before Ali Agca was left to himself in his cell, he kneeled before the Holy Father and he kissed both his hands. The attack is still visible on one of them…” Erdély emphasised the highlighted part of the text in the newspaper cut-out in purple. 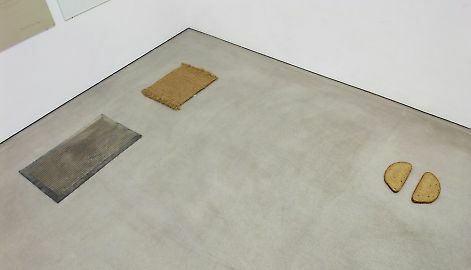 Beyond the band of bitumen, there is a print made by a child’s hand on the right-hand side, whose lower edge fills the larger part of the artwork, and borders a dark blue sheet of indigo-paper that was once folded in eight parts, the traces of these folds still visible. Erdély has placed an old family photo at the lower right-hand corner of the indigo-paper, with the following explanatory caption: “I dance the czardas with my grandmother in 1937”. Starting in 1977, Erdély began to employ indigo-paper regularly in many of his works, and it was at this time that he fashioned his Indigo-drawing technique using indigo- or copy-paper, in connection with the Möbius strip, by which the “original” drawing and its copy are rendered on exactly the same surface. In Hungarian, the name for the indigo- or copy-paper corresponds with that of the Indigo Group, and although this may have been the result of chance, this technique of “copying” or “reproduction” could also be seen as a metaphor for his “teaching technique”. 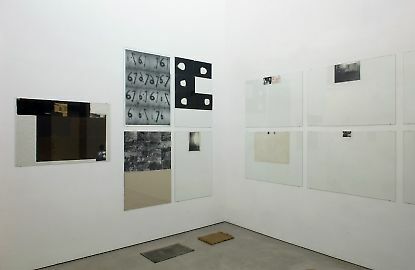 The primary motif of Zoltán Lábas’s 16-part photo series was the shadow projected onto the wall of the number cut out from each paper and suspended (though not visible in the pictures): of the six and the seven. Tivadar Nemesi’s four-part photo series depicts the artist himself while practising some sort of magic activity, which might just as well be a performance as a shamanistic ceremony. László Révész showed a found photo, in which objects were visible – a pair of scales, a coffee-grinder, a language book and an alarm clock – that could be found in the flat of Révész’s grandmother. János Sugár’s photo portrays two bright spotlights mounted on stands turned toward each other, which were compared to human figures made from rods. The picture appears on the backing surface from a slight view from below, which served to accentuate the “personal perspective”. In János Szirtes’s work entitled Our Home is Earth, 16 photos glued side by side to the upper half of a white cardboard sheet, comprises a 4 x 4 matrix. Thirteen of the photos depict trees and bushes, while the other three show skinned animal pelts, Coptic reliefs marked with a cross, and a wooden altarpiece (Pieta). One of the possible interpretations of the artwork could be that the personal and the sacred become inseparably intertwined in our everyday milieu, whether it concerns pantheism, shamanism, or the ecology. 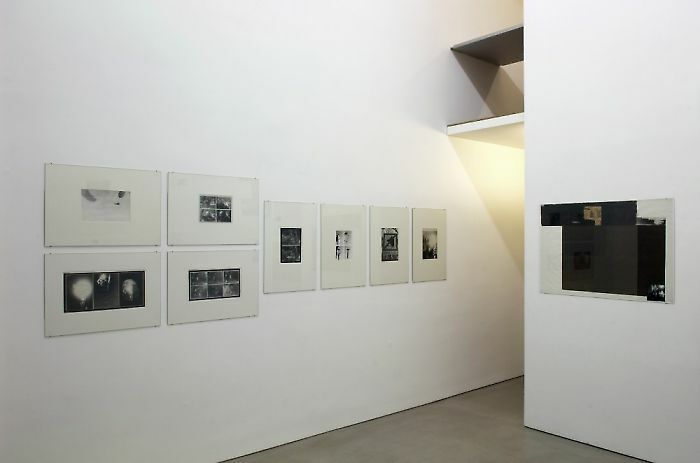 Alongside the works of the Indigo Group, a small selection of photographic works made by Miklós Erdély before 1984 is also on view. 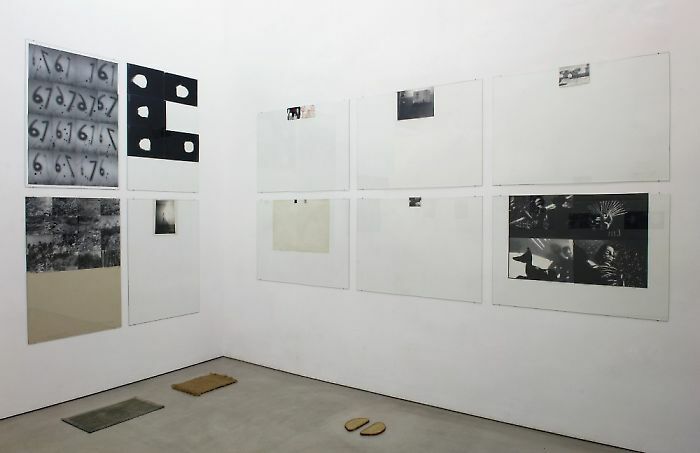 Erdély, who made sculptures, graphic works, paintings, objects, collages, environments, conceptual works, actions, films and videos, from the late 1960s used photography and photograms as autonomous tools of expression and as creative elements of individual works. An example of the latter is his work entitled The Personal and the Sacred, which was the last such work he made. Erdély himself did not photograph, but either found his photos readymade, or had someone (most often, his own sons) photograph what he needed. He often illustrated with photos or photo-actions his art-theory-philosophical-poetic texts, and often employed photos to observe the phenomenon of the image, mapping and representation, but for his conceptual examinations. According to László Beke, in his conceptual use of photography, the metaphor of photography as art stands. At the same time, in many of his photographic works, he placed one or another element of photographic technique, for instance, light, at the centre, as in the case of Evening Action (1969) or Self-Illumination (Light Eats up Man) (1969), from among his exhibited works. The “mistake” of “flash overexposure” in the latter work became the departure point for a metaphor-making process. His 1972 Metaphor Studies are similarly poetically charged, while his No Photographs! shown at the exhibition organised on the occasion of the 1974 conference, Culture and Semiotics, touches upon the question of the interpretation of symbols: it concerns “pragmatic mistaking of rules taken in the semiotic sense” – in the words of László Beke. The conceptual origins of his 1980 Sacred Line can be traced to a conversation with Gábor Bódy on film as material, which Erdély commented upon thus: “I was arguing with Bódy in a pub about what obscene material film is. … I explained how much more the concrete meeting of graphite with paper is worth, what a transfigured moment it is when one puts the graphite pencil on a pure white sheet, or anything at all. … Afterwards I tried to think of ways to make it even more ether-like. It was then that I came up with that ‘sacred line’ thing: I put a piece of lead on a pencil, tie a piece of string on the end and then draw the line. And indeed, this is an absolute moment of leaving a trace, such a noble compromise of interference and the independent behaviour of material, that perhaps only in the world of God exists something like this. To leave matter somewhat to its own devices to do what it wants to, yet to control it. Sometimes I have the feeling that with a method like this, one cannot draw an unattractive line.” His photographic work entitled Relaxation or Work is the visual recording of an idea performed as an action in 1983, which, according to one of Erdély’s sons, can be traced to the following Biblical citation: “And he said unto them, The Sabbath was made for man, and not man for the Sabbath” (Mark, 2:27). The first presentation of the exhibition arranged from the photographic works of Miklós Erdély and the Indigo Group took place at the Kisterem Gallery in Budapest in May through June 2008. 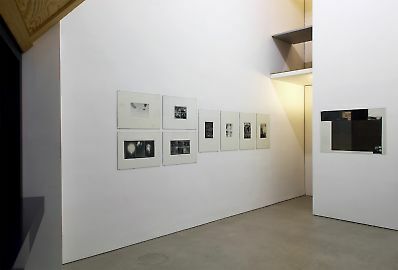 The show was realised in collaboration with the Miklós Erdély Foundation, and an unusual timeliness was provided by the fact that at the same time, the exhibition Fluxus East – Fluxus Networks in Central Eastern Europe was on view at the Ludwig Museum Budapest; an exhibition organised from the contemporary art collection of the Erste Bank Group at the ICA – Dunaújváros; and the exhibition entitled Concept, Conception, Extracts, organised by Dóra Maurer (Open Structures Association) in the Vasarely Museum; embedded in the context of which, individual photo-works of Miklós Erdély were on view. In parallel with these, the volume presenting the art pedagogical activity of Miklós Erdély was published, in which Indigo works visible in the current exhibition were published for the first time.